Welcome to the Department of Chemistry! Spin coating epitaxial films. Left: cartoon of spin coating process. Right: electron and optical microscope images of spin-coated materials. 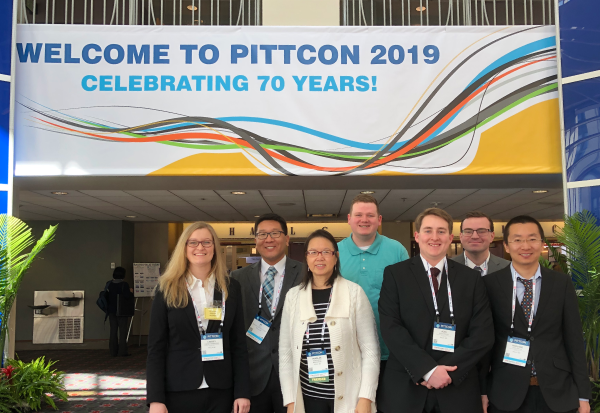 Students from the Honglan Shi group attended the International Analytical Chemistry Conference, Pittcon and EXPO 2019. Spring 2019 Chemistry Newsletter Now Available! Ph.D. candidate, Sangeeta Sur, is studying a stabilization step of the Chapman cycle, which is a part of formation and destruction of ozone. Stephen Murphy, an undergraduate student in the Glaser lab, shows the results of a crystallization experiment for a compound he helped to synthesize. Dr. Honglan Shi, research professor of chemistry, and graduate student Ariel Donovan are pictured at work in the new Center for Single Nanoparticle, Single Cell, and Single Molecule Monitoring. The Spring 2019 Chemistry Newsletter is now available! This newsletter is a quick look at the recent accomplishments of faculty, students, and alumni. It also highlights some of the cutting-edge research happening in the Chem department at S&T and includes descriptions of brand new instrumentation acquired this past semester. Take a look and discover the exciting new developments happening on campus. Congratulations to Dr. Grubbs, who was named a Texas TRIO Achiever by the University of North Texas. TRIO Achievers are named based on their successful participation in the TRIO program and are recognized for their outstanding academic achievement. The TRIO Achiever candidate must have made significant civic, community, or professional contributions. Congratulations to Siddesh Umapathi, who won the three minute thesis competition that was put on by the Office of Graduate Studies. Three Minute Thesis (3MT®) is a competition for graduate students to develop and showcase their research communication skills. Presenters are scored by the judges based on comprehension/content, and engagement/communication. Siddesh presented his work on hydrogen as a potential fuel source. He will be representing Missouri S&T in the Midwest Association of graduate schools, coming up in March.